You know the lyrics, you remember the album cover, you might even have a model version of the famous submarine at home. While we haven't been able to live in one, thanks to the crafty workmanship of a Liverpool businessman, now you can stay in one. 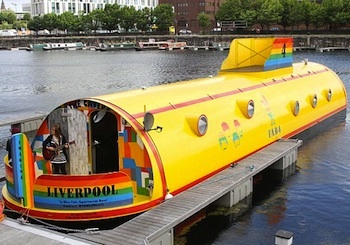 The UK's Daily Mail reports that a floating hotel - painted to look just like The Beatles famous yellow submarine - is welcoming guests England's Albert Dock in Liverpool. Reports from ClickLiverpool say Alfie Bubbles, who claims he's not a Beatles fan, purchased the boat from Paramount (which used it in the film "The Hunt For Red October") and turned it into an 80-foot hotel. The submarine can accommodate up to eight people, and has a psychedelic lounge complete with the original scooter from the film "Quadrophenia." Of course, in keeping with modern times, the 2012 version of the yellow submarine has 3D TVs and WiFi. Rates for the hotel are approximately $230 (£149) per night Monday through Thursday, $462 (£299) on Friday and $541 (£350) on Saturday. Readers: Would you stay here?